This tutorial provides you with a foundation for working with importing into Adobe Photoshop Elements. It is the first lesson in the Adobe Photoshop Elements 10 Digital Classroom book. Adobe Photoshop Elements is an easy-to-use solution for organizing and editing your digital photos. You will be up-and-running, creating beautiful photographs before you know it. To start, you’ll need to import images from your camera or computer. You will work with several files from the Lessons folder in this lesson. Make sure that you have downloaded the Lessons folder onto your hard-drive. In order to access these files, you need to import them, which you will do in this lesson. Before you start, note that the Photoshop Elements Editor remembers the last panel layout that you used. Before starting, make sure your tools and panels are consistent with the examples presented in these lessons by resetting the panels, by choosing Window > Reset Panels within the Editor. If you are ready to start working with your own images, you can jump ahead to “Adding Files and Folders to the Organizer” found later in this lesson to start working with files that came with this book. The fact that you’re reading this book indicates that you probably already own or are considering purchasing a digital camera. It’s probably also accurate to say that you’ve been taking photographs and truly enjoying the flexibility that digital photography has to offer. The ability to shoot as many images as you like, or at least as many as will fit onto your camera’s memory card, is one advantage that digital photography has over traditional film cameras. Another advantage is that you can choose which images to keep and which ones to delete from your camera’s memory card, instead of sifting through the photos that you had developed at your local photo store, picking out the good ones, and throwing away the bad ones. With digital photography, you only pay for the good photos! So you’ve figured out how to shoot pictures with your digital camera but you’ve found that the clunky interface on your camera requires a lot of time to sift through the images in order to delete the poor photos that you don’t want. In addition, your photos may be accumulating on your camera’s memory card, requiring you to constantly remove images to make room for new ones. These are only a few of the problems that people are faced with in this world of digital photography, and this is where Adobe Photoshop Elements 10 fills a void. Photoshop Elements provides you with the ability to import, organize, adjust, and output your images in limitless ways. Photoshop Elements makes organizing and editing photos a snap, by giving you the tools needed to accomplish everyday tasks without the complexity of the full version of Photoshop. With Photoshop Elements, you can utilize keyword tags, ratings, captions and other features to identify your images so that you can search for and find them easily in the future. You’ll never lose an image again. Let’s get started! When you launch Photoshop Elements, the Welcome screen opens automatically. The welcome screen is a gateway to the workspaces that are available within Photoshop Elements. Workspaces are different environments built into Photoshop Elements that allow you to perform different tasks. You’ll get a closer look at workspaces later in this book. Organize ( ): This is like a digital filing cabinet. You can rename your files, add keyword tags, add ratings, and categorize your photos. Lessons 1 and 2 cover the Organizer. Edit ( ): This is where you can make adjustments to your photos. Fix exposure, color, and contrast, remove redeye, and much more. Lessons 3, 4, and 5 are focused on editing. 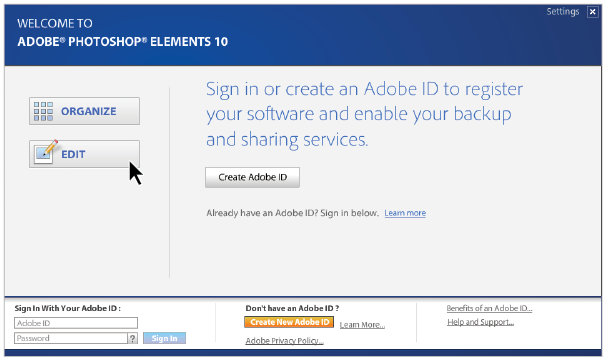 From the Adobe Photoshop Elements Welcome screen, you can launch the Organizer, Editor, or sign on to Photoshop.com to share your images. The Photoshop Elements Organizer is your creative hub. It can be used to organize your entire photo library, as well as perform a few quick editing tasks. It is not a simple file browser like your operating system uses; it is more of a photo management system, allowing you to organize, tag, and manipulate content. Before you can use it to the fullest, you must first import your images into the Organizer.